Appréciation d'ensemble / Overall evaluation : "Well worth acquiring." Though best known as a composer for the harpsichord, François Couperin also composed motets, a Magnificat and at least three Leçons de Ténèbres. The last – composed for the nuns at Longchamp Abbey – were his only published sacred works (c1714) and provide striking, elegantly crafted settings of the Lamentations of Jeremiah for Maundy Thursday, with sinuous settings of the initial Hebrew letters, compelling recitatives, chromatic arioso passages and glorious ‘Jerusalems’ to end. They have inspired numerous recordings since that of Alfred Deller (c1960), including the memorable 1978 LP with Judith Nelson, Emma Kirkby and Christopher Hogwood and the highly regarded 1997 CD with Sophie Daneman, Patricia Petibon and William Christie. 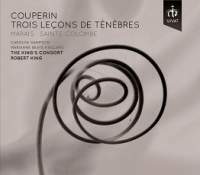 The recording under consideration here is Robert King’s second bite at the cherry, having already recorded the Leçons with the countertenors James Bowman and Michael Chance in 2000. The soprano Carolyn Sampson and mezzo Marianne Beate Kielland, both highly regarded as Baroque specialists, deliver fresh performances that are at once serious, stylish and beautifully judged. The viol player Susanne Heinrich and theorbist Lynda Sayce join King, accompanying on a chamber organ, and offer sensitive support to the singers. To round out the disc, Heinrich contributes admirable performances of two viol pieces by Couperin’s contemporary and colleague at court, Marin Marais, and one by the violist known only as Monsieur de SainteColombe le fils, though I might have wished for more poignancy in the playing, especially in Marais’s magnificent Tombeau pour Sieur de Ste Colombe (possibly le père or, if not, l’oncle) and Sainte-Colombe’s shadowy Prelude in E minor. Well worth acquiring.